Coslys Organic Lily Face Scrub exfoliates gently normal and combination skins with its creamy texture. Rich in purifying rice powder, it wipes away impurities and refine the skin texture. Coslys Organic Face Scrub contains Organic Jojoba Oil and Organic Lily Extract to protect and rejuvenate. Your skin is smooth and glowing ! 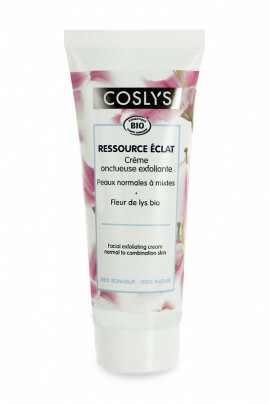 Once a week, apply COSLYS Organic Lily Face Scrub using circular motions on wet skin, avoiding eye contour area. Rinse abundantly with clear water. Follow by applying Coslys Face Mask. This organic face scrub is packed with 99% natural ingredients ! Aqua (water), spiraea ulmaria flower extract* (organic meadowsweet floral water), caprylic/capric triglyceride (emolliant from coconut and vegeta glycerin), cetearyl alcohol (vegetal emulsifier), glyceryl stearate SE (emulsifier from coconut and palm kernel), oryza sativa (rice) hull powder (rice powder), simmondsia chinensis (jojoba) seed oil*, cetearyl glucoside (vegetal emulsifier), lilium hybrid flower extract (lily extract), lilium candidum flower extract* (organic lily extract), chondrus crispus (carrageenan) (thickener), glucose (sugar), xanthan gum (thickener), parfum (100% natural fragrance), glycerin, benzyl alcohol (conservative), citric acid (pH regulator), dehydroacetic acid (conservative), sodium benzoate (conservative), potassium sorbate (conservative), limonene, linalool (components naturally present in the fragrance).